Marine Pfc. 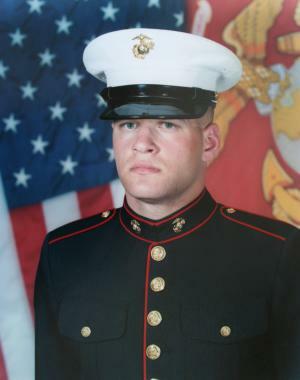 Matthew Bertolino - Run for the Fallen New Hampshire, Inc.
20, of Hampstead, NH; killed when the vehicle he was traveling in rolled over during a combat patrol near Jalalabad, Afghanistan. Matthew was the third child of Stanley and Joyce Bertolino. Matt is survived by his two older sisters Kristen and Kimberly. He was mature far beyond his twenty years, yet still had a childlike innocence about him. His smile could light up a room. He laugh was contagious. His hugs could take your breath away. Matthew felt a deep calling to serve his country. He wanted to make this a better world for everyone. He was proud to be an American and equally proud to be a Marine. Matthew wrote a letter home to his sister from boot camp saying that, "he left a boy, became a man, and was returning a Marine." To Matt it was a privilege and an honor to be a Marine. Matthew wanted to become a police officer in New Hampshire when his tour of duty was over. He felt that was a way he could continue to serve and help others. He once told me that it would be the perfect job for him. A scholarship fund has been set up in Matt's honor at his high school, Pinkerton Academy. A senior pursuing a career in the criminal justice filed is chosen each year. I ask each year that the winner please take Matt along with them on their journey, because they are living his dream. Matthew was extremely loving and generous. Friends and family knew that he could always be counted on when needed. His support and help to me at an early age was remarkable. Matt would even take me to the movies on a Friday night if he knew I wanted to go, rather than go with friends. He always put others first. Matthew loved the outdoors. He had considered landscaping as a career for a while Our home as many gardens, rock walls and walkways that he created. Each one a gorgeous gift. I feel very close to him when I am outside. I have created a memorial garden for Matt at our home. It is my sanctuary. Family and friends come to visit him there. I hope to expand the garden to honor other New Hampshire soldiers that have fallen as well. I believe Matt would like that. Carpentry was also something Matt enjoyed. His grandfather was a carpenter. They both loved creating with their hands. Matt briefly worked for a craftsman, learning the art of cabinet making He designed and built new kitchen cabinets in our home. He had them partially installed before leaving for boot camp. I see all of his beautiful craftsmanship around our home daily and feel him there. Matt's Jeep was another passion that he had. He worked two jobs to have it paid off before joining the Marines. Countless hours were spent taking it apart and fixing and improving things on it. He wanted to make it just perfect. He loves going for long rides with the top off, listening to his music. It was a great place for him to be. I have kept his Jeep, unable to part with it. It is so much a part of him, so that another way that I can keep him close. Matt loved sports. He was a Red Sox and Patriots fan. He played football with friends, and he wrestled in high school. He love the snow. Skiing, snow boarding, and show shoeing were his favorite winter past times. Our last family trip was ot the White Mountains to ski and snowshoe. He would also golf and play paintball with his dad. Several times a week he would be at the gym working out. He even had a weight lifting bench in his room,. being physically fit was very important to Matt. Matthew wanted to see the world. As a Marine he believed he would get that opportunity. Matt planned on getting a tattoo and wanted it to say, "Everyone is alive, but not everyone truly lives." I wonder every day what great things Matt could have done is his earthly time had not been cut so short. I and everyone that knew Matt were blessed. Matthew was a gift. I cherish every memory and need to know he will NEVER be forgotten for his service and sacrifice. Matthew entered the Marine Corps through the Marine Corps Delayed Entry Program on September 30, 2004. He started his initial training on January 26, 2005, at the Marine Corps Recruit Depot, Parris Island, SC. Upon completion of his training he became an infantry marine with an 0351 assaultman specialty. His awards include the Global War on Terrorism Service Medal, National Defense Service Medal, Purple Heart, Combat Action Ribbon, Afghanistan Campaign Medal, Navy Sea Service Deployment, , Medal, and Expert Rifleman Medal. He is survived by father and mother Stanley and Joyce Bertolino and sisters Kristen and Kimberly and his extended family.